We’re back on the cake mix bandwagon, my friends!—but this time: chocolate cake mix. These cupcakes require 1 cup of cake mix from a box of chocolate devil’s food cake mix. If you’re curious about the exact type of cake mix, here is a link. Do not buy cake mix that comes with a pudding or chocolate sauce packet. Chocolate cake mix that says ‘the pudding is already in the mix’ is totally fine. I feel like I shouldn’t have to say this, but just in case you were thinking it: no, brownie mix will not work. But thanks for the idea, I will definitely work on some scaled down desserts using a brownie mix in the future! This recipe makes just 6 chocolate cupcakes. They bake up perfectly, and the ganache dip with crushed candy canes couldn’t be easier. I had leftover crushed candy canes from my Peppermint Mocha Affogato, and instantly knew that their destiny was a wet pool of ganache. I can think of lots of occasions where you want to give someone a sweet treat, but 2 dozen cupcakes is overkill. Everyone loves a small batch of cupcakes. 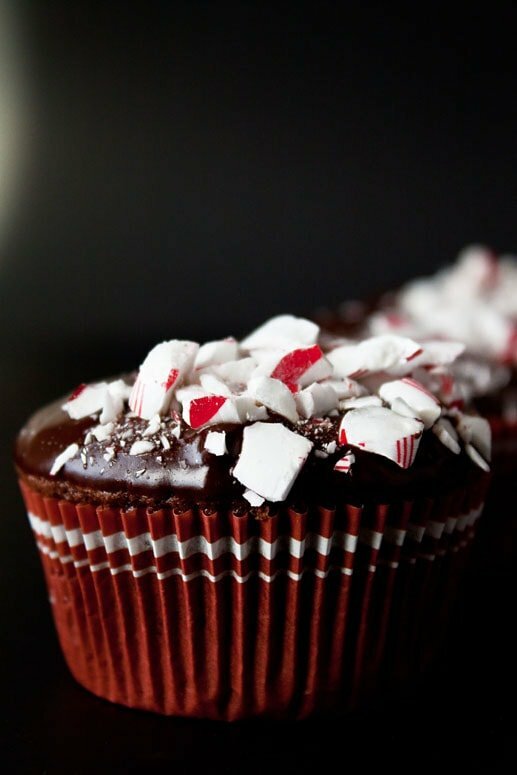 You can dress up the top of the cupcakes however you like: instead of crushed candy canes, would you fancy sprinkles? Mini chocolate chips? Chopped nuts? Endless possibilities from 1 cup of cake mix. Life is sweet, isn’t it? Preheat the oven to 350, and line a cupcake pan with 6 cupcake liners. In a medium bowl, combine the cake mix, egg, water and cream. Beat with an electric mixer for 1 minute. Divide the cake batter into the 6 cupcake liners, and bake for 18-20 minutes, or until a toothpick inserted comes out clean. In a small bowl, melt the chocolate chips and butter in the microwave in 15-second intervals, stirring between each. It should only take 2-3 pulses. Stir in the peppermint extract once the mixture is melted smooth. Have the crushed candy canes ready in a bowl. 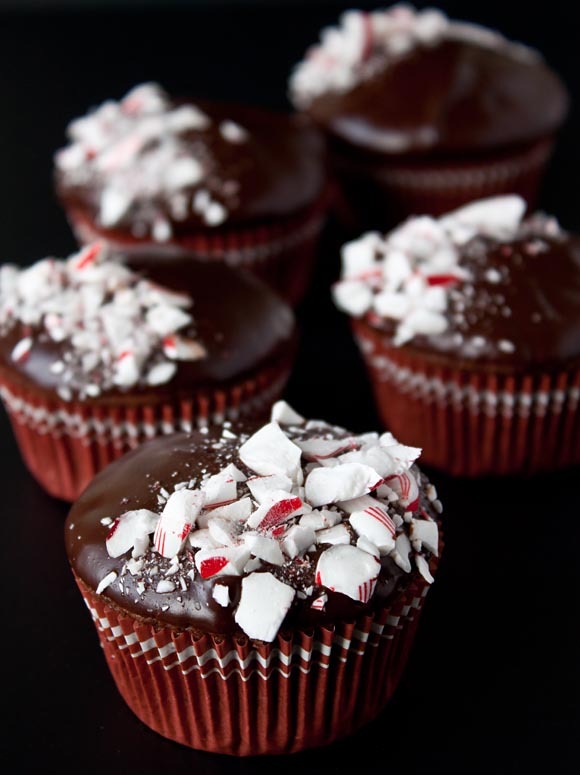 Dip the top of each cupcake in the melted chocolate, and then roll in the crushed candy canes. You can let the chocolate harden in the fridge for 30 minutes, but do not store the cupcakes in the fridge any longer than that because the candy canes will weep. 6 cupcakes is perfect for me to eat in a day! I love the peppermint, chocolate combination, these really would make an excellent gift! What a lovely recipe and a lovely idea! You’re right — It’s kind of overkill to bake those 2 dozen cupcakes, but 6 are the perfect amount for sharing. Thanks! That is the perfect amount of cupcakes! More than that and things get dangerous–haha, or I need to get them out of the house as soon as possible. These are beautiful Christina! I love these!! so festive!! and love that you used a chocolate devil’s food dry cake mix! perfect for the holidays when I need something quick! Oh they’re so gorgeous! I love your cake mix recipes and can’t get enough of this chocolate/mint combo you’ve got going on! Love the chocolate mint combo. These are absolutely beautiful. 6 cupcakes is the perfect amount! Love those candy cane bits on the top! I love the idea of making 6 cupcakes! My daughter and I have a girl’s night every so often and look for recipes where we can make just a few cupcakes or cookies. Love this! Wonderful photos too! Very pretty! Where did you purchase the cupcake liners? Hi Trish! My Mom bought me the cupcake liners at Sur La Table. It was quite a few months ago. I have seen similar ones at Joanne’s and Hobby Lobby recently :) Good luck! These look great, very pretty and much better portion size. Give me all the peppermint! Seriously. Look great! These look awesome, Christina! 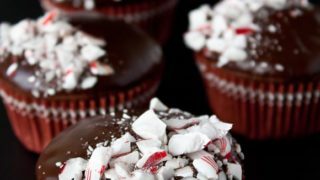 I’m totally obsessed with the chocolate-peppermint combo this time of year and these cute cupcakes are RIGHT up my alley! i love peppermint crunchies! they look yummy! Yum! I’d like to take a moment to let you know how much I enjoy your blog and really appreciate all the time and effort you put in to working up these recipes!! I found that I simply quit baking over the years because the batches were too big for two people to handle….and one being a diabetic. I’m looking forward to getting back into a very favorite hobby again. I love your website and have made many recipes to satisfy my sweet tooth. I love that the portions are small; makes me feel less guilty that I am baking so much. I am celebrating my sons birthday next week and I got the idea to make 5 types of cupcakes because its his 5th birthday. Your site works the best because I can make small quantities of each. I am going to be baking them a day in advance. This recipe mentions that the cupcakes should not be in the fridge for more than 30 mins to avoid issues with the mint. How do you recommend that I store it? Is room-temp fine? Could I use mint instead of peppermint extract? Will scaling down on the amount of mint extract help?